You have had some great success at Ledgestone, including a second place finish. What will it take for you to get over the edge and win the event? I have had success at Ledgestone and I try to pick the 3-4 holes that I play fairly conservative out there and play slightly more aggressive on the other holes. And of course stay in bounds! Lake Eureka is one of the most punishing courses on Tour. Do you think that kind of course suits your game well? I do think Eureka suits my game because I consider myself an intelligent player and understand how to think my way through a course. With that much out of bounds, a successful player must minimize the penalty strokes to score well. What makes Ledgestone a special event? The most obvious answer to this question is the money! Each year, this is the highest paying event we play and it definitely stands out on the schedule for that reason. It is also extremely well run and organized and I very much enjoy the challenge of the Lake Eureka. What is your favorite hole at Lake Eureka? My favorite Hole just might be hole 1. 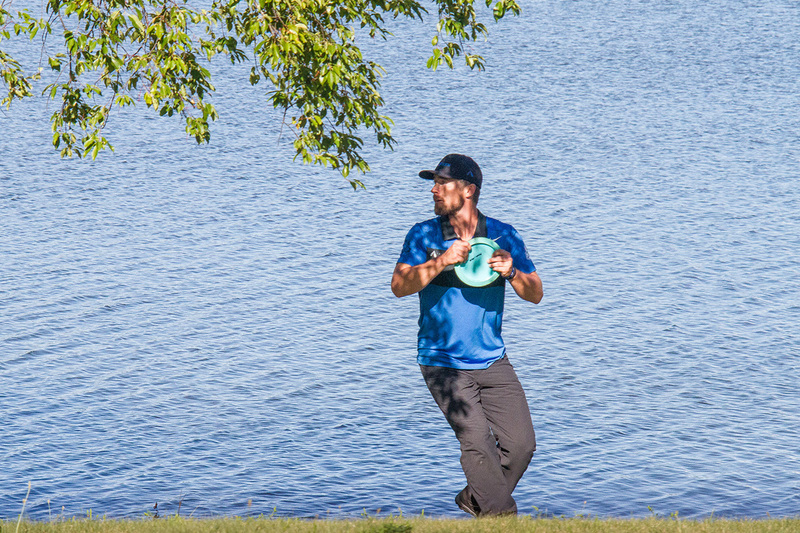 It is quite intimidating to throw over an expanse of water with a distance driver for your first throw of the round. The wind is usually substantial and the nerves are there. The challenge is real! What is your least favorite hole at Lake Eureka? I think my least favorite hole would have to be the Water Tower hole. The reactions off of the tower are just too random to be fair. Perhaps eliminating the Out of Bounds altogether on this hole would eliminate the penalty strokes for one of two people who throw very similar shots but have different reactions off of the tower. After the 2015 event several people criticized the course design at Lake Eureka. Some of it was justified and changes were made after that year. You were one of the few people who said positive things. Your post went viral on social media when you told people you would come back every year and that you had earned every OB stroke you took att that event. Why did you choose to defend the tournament? Tournament Directors are rarely praised for their hard work and dedication but often criticized and scrutinized. I witnessed firsthand how much fundraising and work Nate put in to hosting us all in Peoria. The amount of money he raised and the time that must go into doing that was mind blowing to me. When I heard people complaining after the event, I just couldn't hold back from giving my opinion. There is a sense of entitlement that some touring pros possess that turns people off from dedicating time to helping these same touring pros. I didn't want that to be the case with Nate Heinold, because I personally enjoy playing for such a large purse each year and appreciate his efforts. As for the course that year; the stroke and distance penalty made the player adjust his/her strategy based on the conditions. Some of the players didn't adjust as well as they should have and placed the blame on someone else instead of taking accountability. This is another trait I see in some touring pros. Every time I don't place as well as I hoped in the standings, it is my own fault, and I find it important to accept responsibility for my own performance. Walk us through your practice routine for an event like Ledgestone. Honestly, I have played Eureka so many times now, I don't want to lose any discs in practice so I will play extra conservatively in my Practice round (s). Understanding what areas of the fairways and greens that you can make your mistakes is so important on a tightly roped course like that. Develop your strategy for attacking the course during the tournament and don't have too much tunnel vision that you won't adjust your strategy based on daily conditions. Are there any local food spots you have enjoyed the last few years? Yes! We go to New World Cafe at least twice every year. The Cubano pizza is just amazing! What do the days look like for you right now? What's life like outside of being on tour? Unfortunately, the days here in MN are brutal this March. I just returned from the 3 week desert tour to many feet of snow and frigid temperatures. I want to get out and play, but that is just not possible right now. It allows me more time to focus on my course design and installation work and my Airborn Disc Golf business which have been growing each year. I am going to try and hit the snowboard slopes as much as possible before the winter is over and enjoy this Arctic weather as best I can. I really want to hit the tour a bit harder than in previous years as I have been playing some solid golf so far this spring and my body feels good. My Airborn Team did some offseason work with a Trainer this winter and I certainly feel the benefits. The excitement amongst the fans of the game seems to be at an all time high right now, and it is a great time to be involved in disc golf. I know this is a huge year for competitive disc golf and I am looking forward to doing my best. We appreciate Cale taking the time to answer some questions for us!